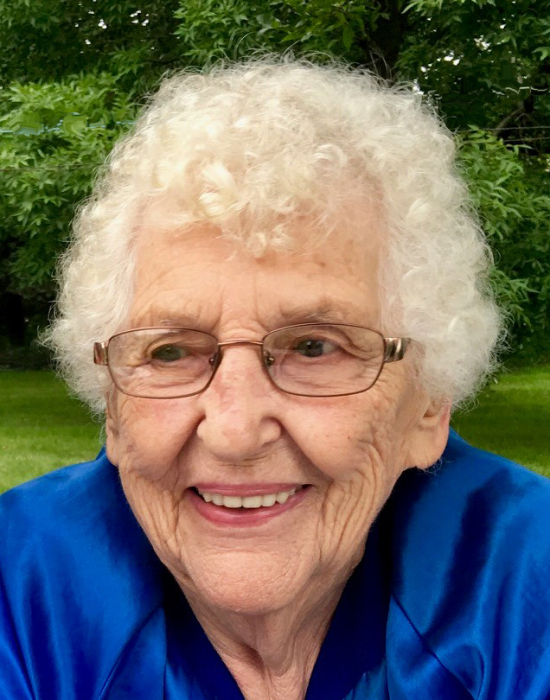 Hertha Bernice Mayer was born February 6, 1931 in Eastern Township near Parkers Prairie, MN, the daughter of Adolph and Ida (Pomerenke) Mayer. She attended elementary school at Miltona, MN and completed high school in Alexandria, MN. On August 17, 1950 Hertha was united in marriage to Marvin “Sonny” Quinn. The couple was blessed with four children. Hertha became the assistant manager and bookkeeper for M-Quinn Trucking. She served in that role for the next fifty-two years. In 1966 they moved to Garfield, MN. Marvin and Hertha operated a hobby farm where they raised livestock and produce. Hertha was both, smart, and self-sufficient. She enjoyed flower and vegetable gardening. Hertha was an excellent baker and cook; her homemade bread and caramel rolls always disappeared quickly. Hertha worked as a teacher’s aide in the Garfield school. She loved helping children learn mathematics. Hertha was active in the New Horizons Group and TOPS. On Wednesday, October 24, 2018, Hertha died at the age of eighty-seven years. She was preceded in death by her husband, Marvin Quinn; and sister, Dorothea Ames. Hertha is survived by her children, Paula Quinn Wallace and husband, Bill, of Carrollton, VA, Edward Marvin Quinn and friend, Van Kalina, of Garfield, John Clifford Quinn of Garfield and Donald William Quinn of Garfield; her grandchildren; great grandchildren; brother, Marvey Mayer; and sister, Darlene Burbee. A memorial service will be held 10:30 AM Saturday, October 27, 2018, at the Anderson Funeral home in Alexandria. Reverend Marilee Bergerson will officiate. Interment will be in St. Mary’s Cemetery in Alexandria. Honorary pallbearers include all of Hertha’s grandchildren and great grandchildren. Arrangements were with the Anderson Funeral Home in Alexandria.